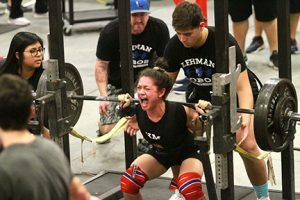 Lehman Lobo powerlifting flexed their collective muscles Saturday as both the boys and girls teams took first place at the 19th annual Hays Powerlifting Meet. The Lobo girls team, which finished with 55 total points, powered past the competition by winning the meet by a 24-point margin over second place Lockhart. Lehman’s Amberlina Saenz was named best lightweight lifter while Mia Palomarez took best girls heavyweight lifter. On the boys side, Lehman took gold by scoring 44 points, which was eight more than second place Hays. Lobo Ty Roaches finished as the best boys heavyweight athlete, while Jacob Vasquez was the best lightweight lifter. Lehman and Hays powerlifting will compete at the annual Lehman meet Feb. 9. Top, Saenz tries to complete a squat of 355-pounds. Bottom, Hays Rebel senior Brandon Garcia strains as he completes a squat of more than 500-pounds.